No EKOS update today (apparently there has been virtually no change), so instead of a projection update, here's a post to help you understand why projections differ. This is the first post of a two-part series on understanding projections. The second post, on how to interpret projections in terms of probabilities, will be available in a few days is available here. Building a projection model involves many decisions: how to weigh polls (sample size, recency, pollster accuracy, etc. ), whether/how to incorporate sub-regional breakdowns and riding polls, whether/how to account for incumbency and star candidates, what to use as a baseline (just the last election or also give weight to historical results), etc. But most of the variation across different publicly available models for this election comes down to one thing: whether the model is based on uniform swing or proportional swing. Proportional swing assumes that if a party goes up/down by fraction X in a region, then it goes up/down by fraction X in every riding in that region. For example, if the Liberals increase from 13.4% to 26.8% in BC, proportional swing would double the Liberal vote share in every BC riding. OK, I get the difference. Does it really matter? It does not matter much when no party went from really low to competitive (or vice versa) in any region. But that's not the case this time: the Liberals more than doubled their support in the West relative to 2011, and almost doubled it in Québec. In such cases, it can matter a lot. Take the BC example from above, and consider a riding where they had 20% in 2011. With uniform swing, they would be projected to get 33.4% of the vote - sufficient on win only in a three-way race. With proportional swing, they are instead projected to get 40% of the vote - sufficient to win most races. Links to all these sites are in the blog roll on the left. *Includes slight turnout adjustment (smaller than this blog's). All uniform swing models have the Conservatives leading. 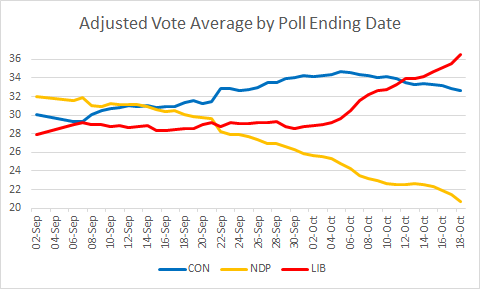 All proportional swing models have the Liberals leading. 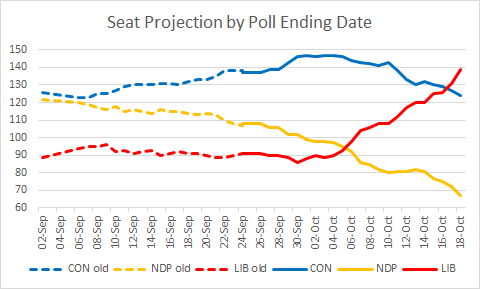 (Update 10/12: The Globe's Forecast now appears to have the Liberals marginally ahead, partly due to its model now assigning zero weight to polls more than one week old.) Variations within each category exist, but they are slight compared to the differences across categories. However, in most elections, proportional swing would have also done very well, so it's very hard to say definitively that one method is better than the other. 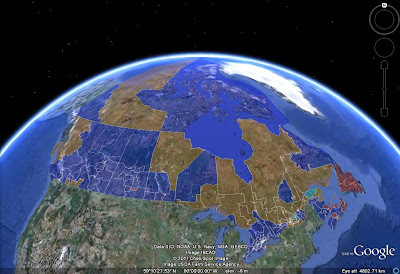 This election may provide a good test, particularly with respect to Liberal results in Western Canada. I would encourage Liberal/Green supporters to take uniform swing seriously, and Conservative/NDP supporters to take proportional swing seriously. This way, you won't be too disappointed come election night! No problem, glad you found this informative! As for polls, I don't have anything better than the stuff you hear others say: random variation, methodology (IVR, online, live), sampling procedure, time of calls, etc. There is a "simplistically" labelled, low, middle, avg, high distribution for the seat projection. The conservatives "likely" bubble has always included the low, middle, and avg points, with the "high" projected as an extreme outlier.